What if I were to tell you that I have been haunted by Dennis Blair for most of my life? Well, in a certain sense Dennis Blair was a tall, rail-thin pitcher who won 11 major league games at the age of 20, then lost 15 major league games at the age of 21, then appeared in only 5 major league games at the age of 22, then did not surface again in the major leagues until age 26, when he concluded his major league career by going 0 and 1 with a 6.43 ERA for Oblivion’s Vestibule, otherwise known as the 1980 San Diego Padres. Called up to the Expos during 1974, Dennis entered the starting rotation and hurled 4 Complete Games with a Shutout. He’s possessed with fine control. The construction of that last sentence intrigues me. I would think the more common vernacular, at least currently, would have that sentence being uttered more succinctly and in an active rather than passive voice, as follows: “He possesses fine control.” But maybe the Topps scribe knew what he or she was doing when discussing the concept of Dennis Blair’s control as if that control was not something he possessed but rather something which took possession of him, like a spirit of some sort, and in turn could just as easily leave Dennis Blair, which in fact it seems to have done: the following year he was not possessed with fine control, surrendering 106 walks in 163 innings, and the year after that it got even worse as he walked 11 guys in 15 and 2/3 innings. Perhaps he spent the next few years before his final go-round with the Padres arduously venturing to various remotely situated shamans and medicine men around the globe in hopes that they could help him once again become possessed with fine control. I picture his skinny frame wasting away even more than it already had as he suffered the intense heat of sweatlodges and fasted in skeleton-littered deserts and licked hallucinogenic toads, all in hopes that he could once again coax the illusive Spirit of Fine Control out from the shadowlands beyond the sky. It’s possible that he was successful in his quest, though it seems to have exacted a toll that nullified any benefits of his fairly admirable final season tally of 3 walks in 14 innings. Perhaps he contracted a rare tropical disease. Perhaps he injured himself embracing a cactus he thought was the Navajo sun god Johona’ai. Perhaps he became possessed not only with the Spirit of Fine Control but also the Spirit of Surrendering Tape Measure Home Runs. I don’t know. I just know that from time to time in my life a thin seam in the world seems to open. I can’t actually see it, not exactly, but I can feel it. This “seeing feeling” of the seam opening up in the world comes to me in the dark, mostly, late at night, the world gone quiet. It may be more accurate to say that nothing is visible in that seam, but nothing is just a word, too, a collection of symbols to stand in the place of something that is unsayable. So let me instead say that the seam is just tall and thin enough to allow a brief and unsettling glimpse of Dennis Blair. To be more accurate still, it is not a glimpse of Dennis Blair that I get but a glimpse of where Dennis Blair has just been. I see him as you might see the visual echo of a bright light on the inside of your eyelid after looking straight into the light. Then the visual echo fades and the seam closes up again, and I’m left once again to this world, this convincing illusion. It has been this way for a long time. I can’t place the exact time when I first caught a glimpse of the seam, but if I had to guess I’d say it occurred during the years directly following the year this card came out. I got the card in 1975, when I was seven, and though I can’t remember my thoughts upon first looking at it I can guess that I may have been impressed by the status of Dennis Blair as a promising rookie. Here is a guy who will be around for a long time. 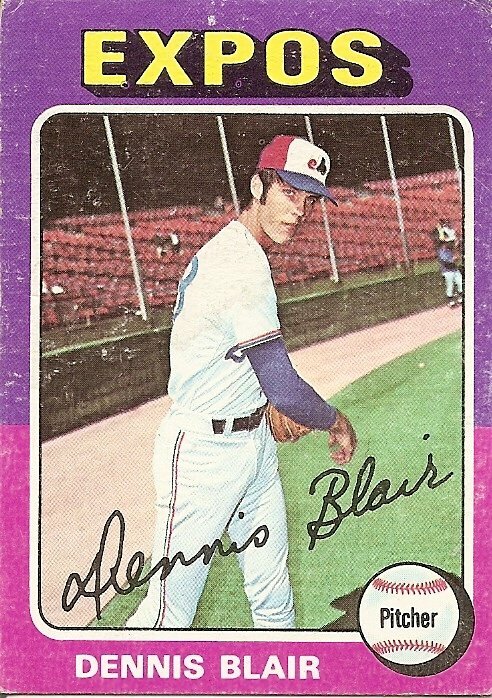 Then when he didn’t show up in the baseball card sets of subsequent years my growing sense from many directions in my life that nothing lasts forever may have begun to coalesce around the ghost of the 1975 image of Dennis Blair. Tall, thin, sepulchral, vanishing. Even his uniform is of a team that no longer exists.